We now officially living aboard!!! Our self-imposed deadline for leaving Ft Lauderdale came and left, our “drop dead date” for leaving soon followed. Things just kept not falling in line. First our sail bag was delayed, then we found a used dive compressor we could actually afford (an awesome find, but a struggle to get installed… especially during the holidays), we somehow swapped out our 3rd new dinghy in a week’s time, have been continuously chasing leaks in the hulls, then last minute we had a middle of the night blackout caused by a bad solar controller and our alternator seems to be mysteriously not charging our batteries anymore (among the other 100 things left undone on our to-do lists). If it isn’t, we leave… plain and simple. But in this case its not that clear cut. We are here in a place we don’t want to be and feeling stuck… yet were doing it for the right reasons, as a part of getting to where we do want to be. That’s a fuzzy line, and it can be a treacherous one. Why? Because built into the same decisions and list making and planning are also a set of underlying fears. In this case, a very large set of fears. Fear works in funny ways. It doesn’t usually present itself in horror movie or haunted house or bungee jumping state of gut wrenching fear… it usually sneaks up on you in other ways. It tends to present itself more as doubts or questions or needs. In the few weeks since we have lived on this boat and in the few months since we first brought up the potential idea of buying a boat we have been introduced to and/or stumbled upon many other people/couples who decided years ago to move onto a boat, and who have been looking for that boat for years. They have spent years trying to get the perfect alignment of the perfect boat, the right amount of money, the best timing and most instruction/research/skills. For all things to align perfectly into one moment. Those people are far smarter than us. I have no doubt they will make far better sailors. But here’s the thing. Some (possibly many) of them will never actually go. Many of them will look back later and wonder “what if?”. That cycle of waiting for perfection can last long enough that even greater hurdles present themselves, or long enough for fear to talk you completely out of the decision you’ve already made and the dream you’re trying to chase. I know my brain well enough now to know that I could so easily fall into that category. 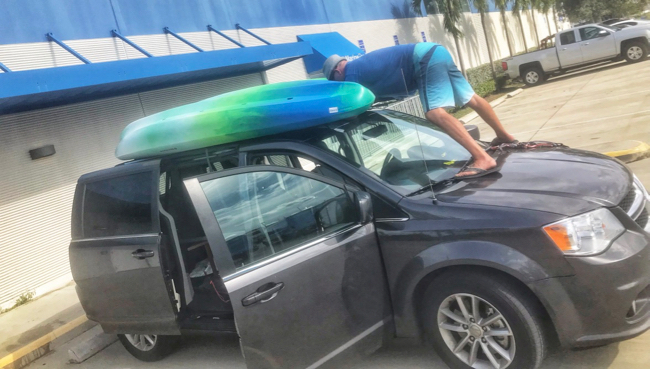 If we had been sitting at home in a comfortable house with plans already laid out for the next few months when we first brought up the crazy topic of buying a boat I would have likely spun into a deep cavern of research, questions, unknowns and possibilities. We could have easily spun out on what makes the perfect boat, or how many years of lessons we need before we can leave or what exactly this will do to our financial plan. I can imagine us buying flights around the country to look at boat options, only to find a boat we liked and have someone else buy it out from under us or finding that one boat that is “so close” but it’s just too much money or just missing that one thing we wish it had. That cycle can go on for years…and my brain is perfectly programmed to allow it. That’s exactly why about 72 hours after we first had a conversation while driving through the Yukon that eventually led to “should we buy a boat?” we put an offer on a catamaran we had never seen that was 5000miles away. Sometimes when trying to take a giant leap you have to simply take that first step and then figure the rest out. For years jen has repeated the mantra to me “leap and the net will appear”. Somewhere in between…I believe lies perfection. The fact that we put a deposit down on a boat meant we HAD TO move ahead and figure out immediately other things that could have made us spin out until next season, and then into the years beyond. 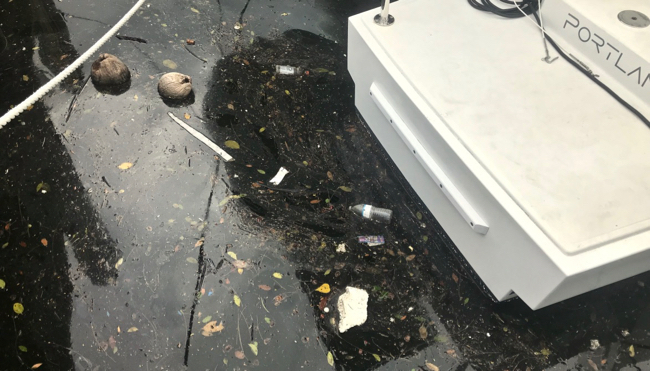 We HAD to find insurance, we HAD to sell our van, we HAD to pack up all our belongings and move to FL and now… because we have no where else to go - we HAVE to push back, leave this marina and begin sailing. No, still don’t have all the answers (so very far from it). 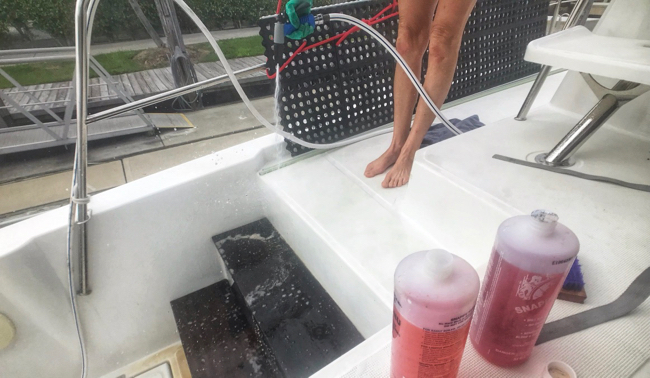 We barely know anything about sailing and we are just barely getting to know how even the inside of this boat works… but we did what we had to do to keep moving forward. We stopped scheduling things that could force us to stay under the description of “need” but really could be tracked back to a fear/excuse of why we hadn’t already departed, we stopped waiting for even better windows of weather when we could admit that the one we had was actually pretty good, and we quit asking about or thinking about the million different “what ifs"?” and we decided it was time. Better yet, we gave ourselves no way to back out. We returned the rental van (finally!) and we cancelled our slip at the marina so they could put another boat here. Then, after all that we started to wonder. “What have we done?” “Is it really time, are we really ready?” I assume this is how people feel when leaving the hospital with their first born child. You’re looking around as though someone should be stopping you or telling you you’re not quite ready. Shouldn’t someone come with us and watch over us for the first few days just in case?? 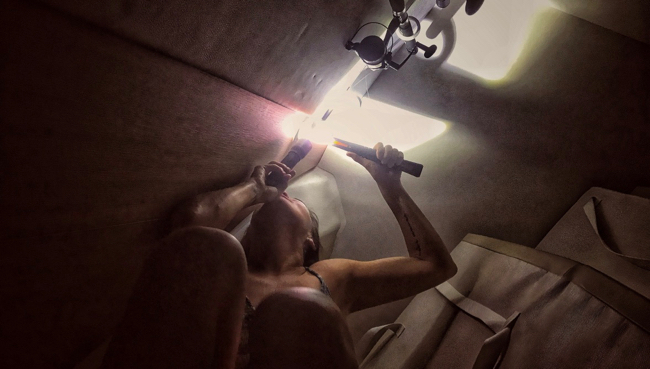 We were about to pull away from the only security we had known in this short life on our boat and both doubt and fear were in abundance as we scurried to finish our much-paired-down lists. We ran our last few errands, which as always took longer than planned, then we went back to the boat to finalize our safety checks and then threw off the lines to leave the harbor. Okay, in hindsight… several people had been shocked when we said we were leaving today. “With the front?” they asked. It was cold, even for us and we just chalked it up to Floridians being Floridians and the idea of sailing in freezing cold weather (meaning mid-50s) was absurd to them. Turns out the bigger issue might have actually been the wind. The wind was blowing stready straight down the harbor that our slip sits at the very end of. We got out of our slip for our planned “grand farewell” and the wind promptly pushed us solid against the back dock beside us. Granted, we had prepared our fenders so no damage occurred. We had inspected and readied for the possibility as a “worse case scenario”. Granted, this is only maybe our 4th time leaving any dock and I’m certain a better or more seasoned navigator could have acted more quickly to get the boat out and spun into the wind before it had a chance to blow us the 10’ onto the back dock… but here we sit. Wind blowing us steadfast against the wall, a few failed attempts at getting it off and horrified that we might do damage to our boat, or worse yet make a failed attempt that has us doing damage to one of the million dollar yachts around us on the way out. We realized we were shouting at the top of our lungs at each other before having the epiphany that we had just purchased a pair of “marriage saver” headsets and paused long enough to run inside, grab them and turn them on (side note: these are easily the best purchase made since buying the boat… possibly ever). These are those points where fear sneaks in cleverly disguised as logic (though even to us it just felt a lot like fear). We should stay and not take the risk. We should play it safe. But instead we settled on “we should try one more time!” Our friends in the cat across they way had come out to check on us and hold lines if needed (probably mostly concerned we were going to crash directly into their home on the way out) and we waited for a few second lull in the gusts before gunning the starboard engine in reverse and hoping the last remaining line Jen was holding onto at the port sugar scoop would turn us out and into the wind. At first, nothing… the wind easily won. I bared down on the throttle and a bit of movement started. 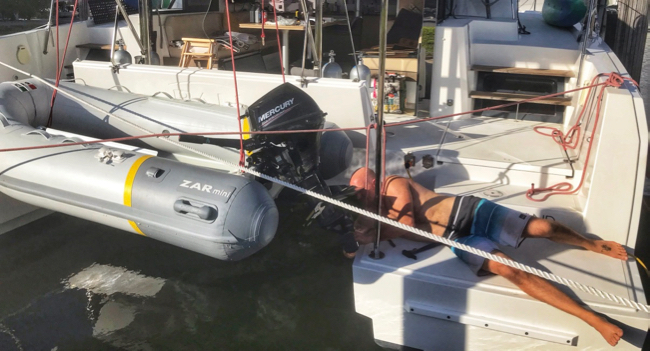 Before long we were slowly fighting back and turning the front of the boat off the dock… our calculated attempt proved fruitful and we raced out of the marina before we could possibly change our minds. Jen ran up to take the wheel. She tells me that steering the boat actually calms her down after one of these heart pounding adrenaline spikes that now seem so common in our days. We sat quietly most of the way out of the marina and down the channel toward the sea. Instead, we pulled out into the ocean, hoisted our sails and made a very windy, very chilly passage (kept 2 reefs in most of the way… todays next lesson: how to reef the mainsail in high winds) south to Miami where we pulled in about sunset and stayed another night at Marine Stadium because light was failing and the route was already known to us. We’d already had our adrenaline spike today and we weren’t about to go seeking another. But… we were free. We now officially live aboard our boat and have no forwarding address. We are now (highly questionably) sailors. We live on a boat upon the seas. Weird. Don’t be disillusioned for a second to think that we weren’t (and aren’t) scared. We are flat out terrified. But in the broader scheme of life we are far more terrified of the alternative. Of missing out on some great adventure because we talked ourselves out of it through fear or logic. Of ever feeling like we are stuck asking “what if?” rather than “why not?” Of even the slightest chance of looking back later in life and regretting the things we didn’t do or the years we wasted waiting on everything around us to magically align. For us, that is simply no longer an option.